According to the gospels of Mathew and Luke, Jesus said to his disciples to turn the other cheek when faced with aggression. After having been beaten up badly by his father, the young boy Tommy limps up the stairs to his room, pulls out a baseball bat from underneath his bed, limps down the stairs and breaks his father leg with a blow from behind. The scene is disturbing and horrifying. In Jeg nekter, Per Petterson is, as always, an eminent realist. We are in touch with the characters, their environment, its sounds and its texture. There are two protagonists of Jeg nekter: Jim and Tommy. We encounter them as inseparable childhood children, and again as middle-aged men where they have not seen each other for thirty years. Tommy’s father beat him but Jim never knew his. Where Tommy was faced with indefensible violence, Jim was faced with a void. Tommy opposes his father, but Jim does not, how do you oppose someone that does not exist? If there is any moral to Jeg nekter, and there is not, but if there were, it would have been that we should refuse when refutation is due. Refuse, not by turning the other cheek, but by setting boundaries, by defending ourselves. Later in life, Jim does not tackle events nearly as well as Tommy does. And though nothing is black and white, Tommy is the active master of his situation and manages to take advantage of the opportunities that arise, whereas Jim has grown into being a dependent slave of the Scandinavian welfare system. As the young Jim says to his best friend, then it is he, Jim, who is the most Christian of the two. Though I do not think that either of the two are particularly religious, Tommy’s fate shows that turning the other cheek can only be a religious maxim. Sometimes the violence and intrusion is so overwhelming that the result of turning the other cheek is the probable destruction of oneself. And only through the existence of a benevolent God who cares about you after your destruction, could the choice to accept destruction by a malevolent aggressor be a meaningful moral act. In other words, if there were no transcendent justice, turning the other cheek would sometimes simply amount to letting the aggressor win, to give up. Sure, the rest of us may perceive turning the other cheek as a viable method to reduce violence, since doing so may prove to the aggressor that we are genuinely not interested in harming him, which might then reduce his aggression, and thereby a moral or at least a rational act. However, this line of thought points to the crucial difference between morality according to Jesus and morality according to Aristotle. Jesus wanted us to do the right thing, and that is, independent of the consequences. God’s standard of judgment does not rely on the causal relations of this world, nor on human praise, and it is only his judgment that counts in the larger scheme of things. Only by this premise can turning the other cheek be the right thing to do, regardless of the immediate outcome of doing so. In contrast to this, Aristotle would call for people to show a measured response to any given situation. The right thing to do is to act considerately and competently in the absence of ultimate principles. This is the difference between reliance on the fulfilment of a transcendent love and justice on the one hand, and a world-directed coping with realities on the other. However, even the Christians must live in this world, as already Augustine noted, and evidently, as Nietzsche among others have argued, reliance on transcendent love and justice is a way of coping with specific situations. 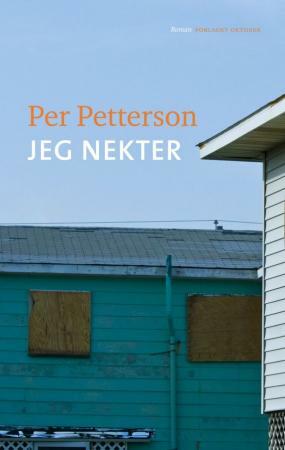 I read Per Petterson’s Jeg nekter as being about ways of coping with difficult situations, and a story about a man who refused, and one who could not and I highly recommend it.